The Edinburgh Centre for Carbon Innovation is an award winning, green business venue in the heart of the city centre, only 10 minutes walk from Waverley Station. This unique building opened in October 2013 and is the first historic, refurbished building in the UK to achieve the building sustainability BREEAM Outstanding Award (design stage). ECCI offers top-of-the-range technology in first class surroundings with a range of conferencing spaces, meeting rooms and a stunning atrium networking/exhibition space that can support parties of up to 280 delegates. As a working building, the Centre hosts businesses and organisations working towards creating a low carbon economy with around 1000 people through its doors every month for meetings, conferences and events - offering excellent promotional, networking and partnership opportunities. Catering partners Edinburgh First can cater for a range of events, delivering anything from meeting refreshments to formal dinners. There is a Cafe on-site open to all visitors and members of the public during opening hours (normally Mon to Fri from 9-5). 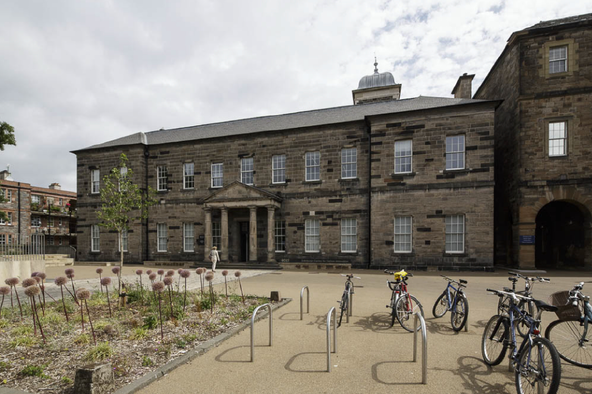 ECCI is part of Edinburgh University’s estate and was opened by her HRH Princess Anne on October 2013. Fast becoming the hub for low carbon business activity in the UK, the venue has attracted a wide range of high profile events and attendees such as the Shell Springboard Awards, Vibes and Salitre Awards.